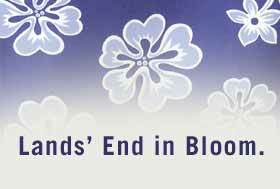 Lands' End Newsletters | The eats that squeak. They sell them next to the cash register at most every rural gas station in the part of Wisconsin Lands' End calls home. Toothsome nubbins of cheesy goodness. Shaped a little like popcorn, only big - big as your thumb. Cheese curds are the freshest product of the cheesemaking process. When the curds are pressed into blocks and the whey squeezed out, that's the cheese you recognize in your grocer's dairy case. But as far back as anyone can remember, people in Wisconsin have been snacking on the fresh curds. In taverns and restaurants, cheese curds show up on the menu as an appetizer, breaded and deep fried. You'll find them at the checkout in grocery and convenience stores. Sometimes even the bait shop or hardware store. Merchants have even been known to put a sign up on delivery day: FRESH CHEESE CURDS. Freshness is everything. A bag of fresh curds will be warm to the touch. With salty droplets of whey inside the clear plastic. And they squeak. When you bite them, that is. Among curd connoisseurs, that squeak is as highly prized as a fine wine's bouquet. "They only squeak when they're fresh." That's Karl Geissbuhler, third-generation cheesemaker and part-owner of Brunkow Cheese in nearby Fayette. For the most part, cheese curds are the product of small operations like Karl's. Brunkow has been making cheese since 1899, when it was founded as a farmer-owned co-op. In those days before refrigeration, turning milk into cheese gave local farmers access to faraway markets. Karl's grandfather came all the way from Switzerland to oversee the operation. Back then, the co-op was turning out Swiss cheese. Which likely made Herr Geissbuhler a shoo-in for the job. Nowadays, with competition fierce from high-volume producers, small cheesemakers like Brunkow have found some imaginative niches. Brunkow sells a monterey jack that's chock-a-block with morel mushrooms. Other makers offer cheese spiked with fresh cranberries. But cheese curds are an area where local operators like Brunkow continue to possess an unassailable advantage. Freshness is everything. So a package of cheese curds is sure to bear the label of cheesemaker only a few miles distant from where the curds are sold. 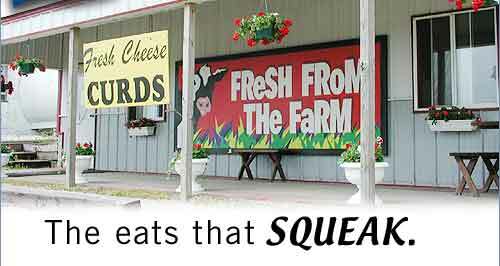 And while Brunkow Cheese offers numerous cheesy delectables on their Web site, you won't find any cheese curds. They're strictly reserved for us locals. But if you ever stop for gas in our part of Wisconsin, do yourself a favor. Forego the convenience of paying at the pump and make a trip inside to pay at the register. The cheese curds will be fresh and waiting. 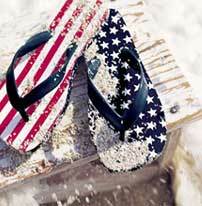 We've got wearable ways to fly Old Glory almost as numerous as the fireworks in an Independence Day sky! Totes and Towels. Swim Trunks and Tee Shirts. Shoes and Polos. Enough for the whole gang to colorfully proclaim their patriotic fervor. Check out the full assortment for MEN, WOMEN and KIDS. Join the daily treasure hunt on our OVERSTOCK PAGES. Save up to 80% off catalog prices. Who knew woven cotton could be so silky? These comfy PRINT SATEEN CROPPED PJ PANTS will have you lingering longer and longer in its luxe sateen weave. Elastic waist with a satin drawstring imparts comfort every slugabed dreams of. Like kid gloves for feet. Plush SUEDE MULES sport uppers of sueded kidskin, one of nature's finest, most supple leathers. Padded insole of lightweight EVA foam provides cloud-like comfort underfoot. Lining is easy-on-the-feet 100% sateen cotton. A handprinted work of art. The BALI BATIK SHIRT is made of fabric handprinted on the island of Bali using the ancient reverse-dye method called "batik." With genuine coconut buttons, of course. Our GIRLS' PRINT A-LINE DRESS slips on it over a tee - and no wriggling required. Comes with a matching drawstring purse. Breezy cotton poplin keeps her cool no matter how hot it gets. Rummage through KIDS' OVERSTOCKS STORE for bargains. This PETITE JARDIN BEDDING is our finest sateen with vibrant yellow and coral bouquets on a white background. The 400-count sheets are made of extra-long combed Supima® cotton. Fitted sheets have 13" pockets and all-around elastic. Set includes flat, fitted sheets and pillowcases. SECURITY GUARANTEED. NO CREDIT CARD RISK. YOUR PRIVACY GUARANTEED. Visit our site to read a detailed discussion of the Lands' End privacy and security policy.